Czech beer brand “Kozel” together with Bootleg (part of BBDO Russia Group) advertising agency introduces “mixed” beer for a new advertising campaign for the Russian market. Mixing lager beer with porter is an old Czech tradition and a not so common way of drinking for Russian consumers. Drinking two sorts of beer together is not about complicated esthetic process but more about having fun. To demonstrate this way of drinking vividly in OOH & Press, Bootleg used diplopia (double vision) effect, which could be easily achieved just by crossing your eyes. 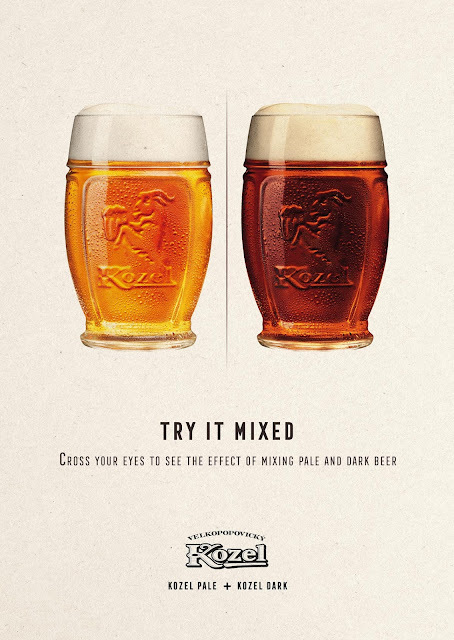 Two Kozel beer cups on the poster are placed symmetrically under the headline: “Try it mixed”. If you cross your eyes, two beer cups will start moving towards each other and meet at one point — lager cup will overlap the porter cup and the third “mixed cup” will appear.